The Gentleman Crafter: Safari Collectors Case- Done! It's been CRAZY around here...So much seems to be going on lately and I'ma runnin'! I am sure everyone else is the same way with getting the kids Back to School goodies ready, last minute summer vacations or just busy day-to-day things that seem to take so much of our time. But...It always seems to get done, doesn't it? All I have to say is Thank God for Centrum Silver! LOL! 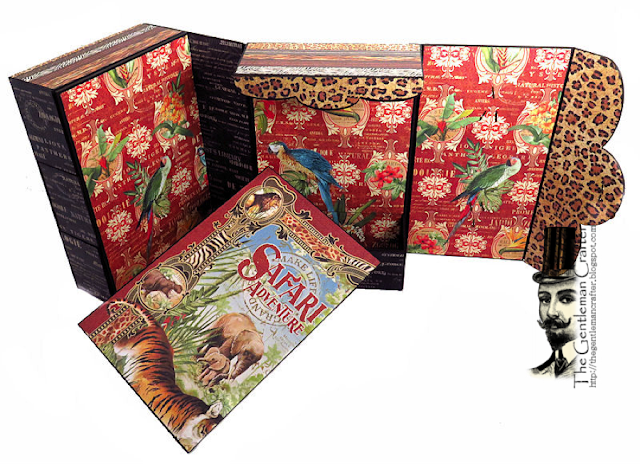 The Safari Collectors Case is so much fun to make. It totally reminds me of younger years when I had a GI Joe RV. It was a compact RV, but you could open it all up and spread it out to have fun. The collector’s case isn’t far from that. 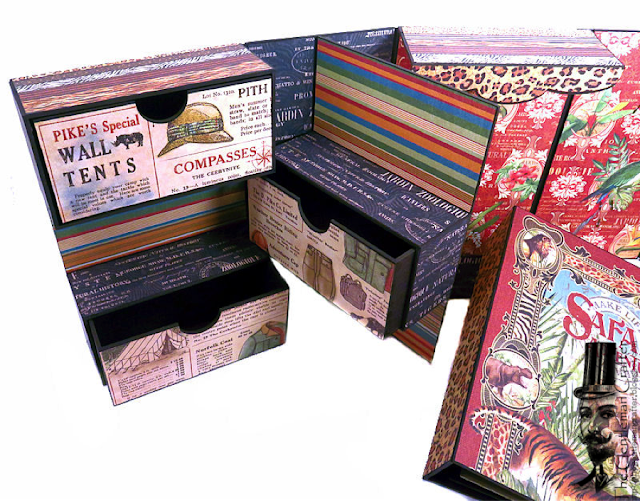 It folds out from a small case to a large fun space to collect your thoughts and memories… You open up the left side to reveal three large drawers for all your keepsakes and treasures. 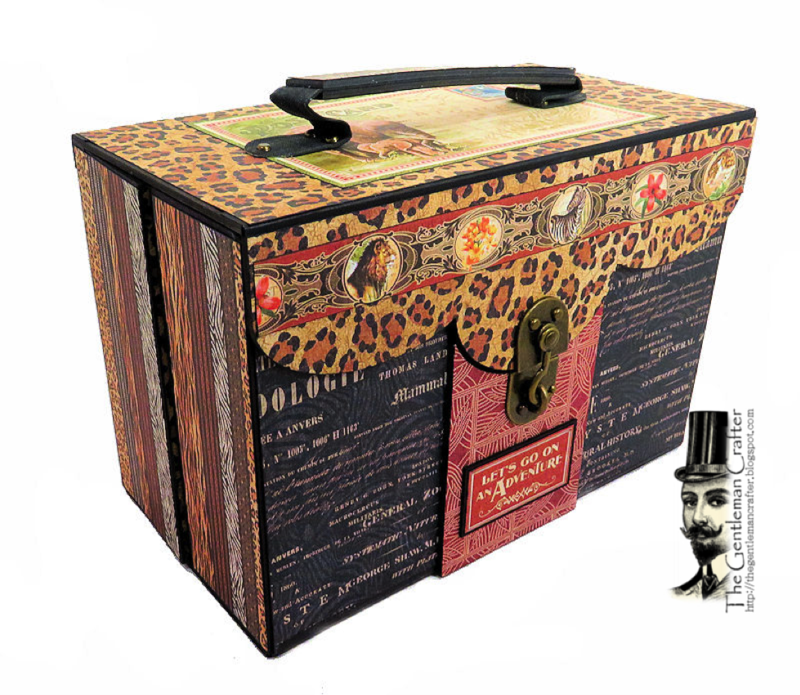 Open up the right side and it has a journal or a mini for pictures, thoughts, inspiration and memorabilia…I just love this piece, Hope you do too. This time around, there are three ways to purchase the project...the Instant Download Tutorial, the Complete Kit with Paper, and the Kit Without Paper. If you would like to order the Instant Download Tutorial please CLICK HERE! If you would like to order this kit please CLICK HERE! I hope you give this case a try. Will be awesome for your summer vacation pictures and memorabilia! Please enjoys these last HOT days of Summer. Be safe and have fun! Ha, I can relate! Running around so fast my hair is on fire, lol. The safari collectors case is amazing! You are amazing. A true artist and engineer. Miss you and Cesar lots. Bigs hugs! Keep taking those vitamins and walks. What a great use of the wonderful safari adventure paper. I love both!